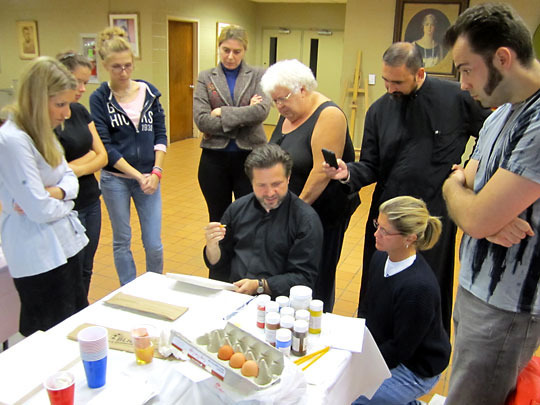 Chicago, IL - In conjunction with the festivities marking the celebration of the completion of fresco painting and blessing of the frescos at Holy Resurrection Serbian Orthodox Cathedral in Chicago, Illinois, an iconography workshop that will teach techniques and practices of icon painting opened here on Monday, September 20th, led by Professor Dr. Fr. Miroslav Simijonovic from Zurich, Switzerland.The following parishioners from our Church community have enrolled in the icon-painting class which will last until Thursday: Natalija Savich, Marko Petrovic, Tamara Djordjevic, Suzana Tesla, Marta Vukasin, Marija Papadopoulos, Barbara Tatic. The goal of the workshop is to learn the iconographic technique how to paint an icon and by the end of the workshop every participant will produce and icon of Christ with gold leaves applied to the halo. Fr. Miroslav was kind to bring from Zurich, Switzerland, already prepared wooden boards, which the participants had to sand before they started. “The goal of this workshop is to learn the Christological foundation of iconography with a special emphasis on the theology of light,” added Fr. Miroslav. According to the teachings of the Orthodox Church, iconography is a visual representation of the theological truths of our Holy Faith in paints and colors.